Published: Mar 18, 2019 · Modified: Apr 20, 2019 · By Jen Sobjack · This post may contain affiliate links. 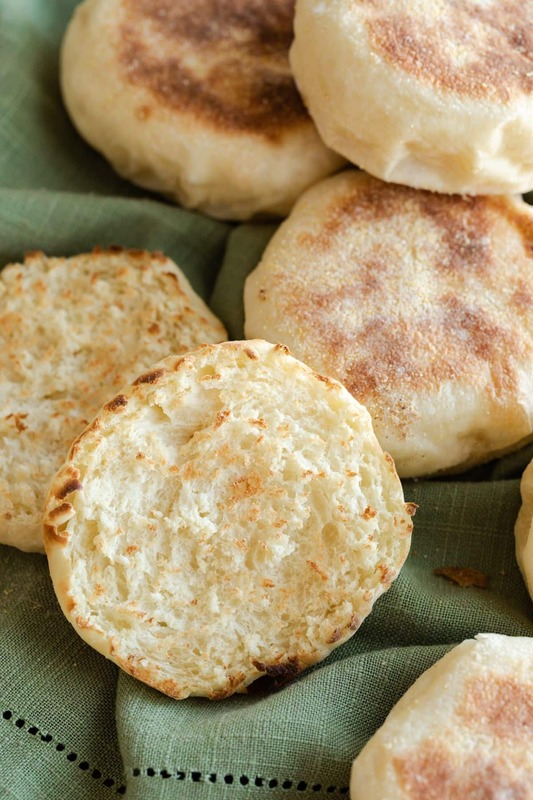 This Homemade English Muffins recipe is so much easier than you think! It’s so simple and will give you soft, chewy muffins in no time. Enjoy them with butter or your favorite jam! This recipe turned out to be a winner and it’s actually quite simple. 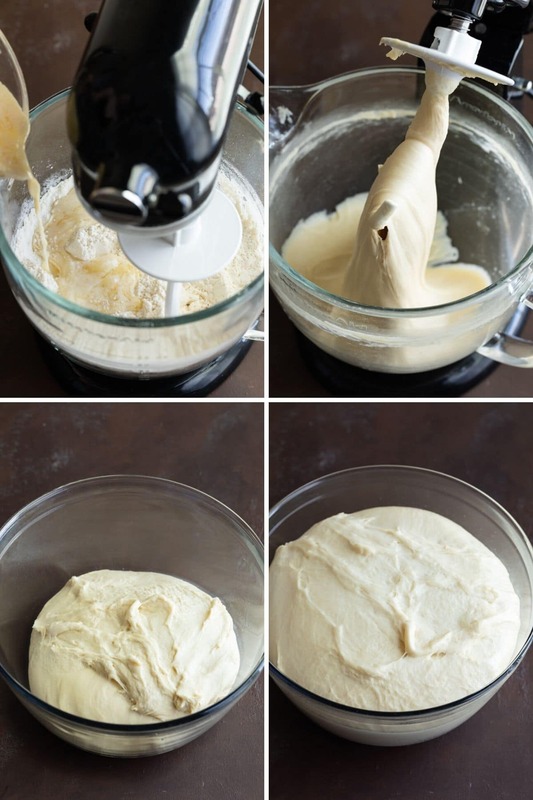 Simply mix the ingredients in a stand mixer and let the dough rise, then shape and cook. Who doesn’t love a toasted English muffin for breakfast? Unlike banana bran muffins and cinnamon raisin muffins, English muffins are leavened with yeast. They are typically served sliced and toasted with a sweet or savory topping. You can even make sandwiches with them. 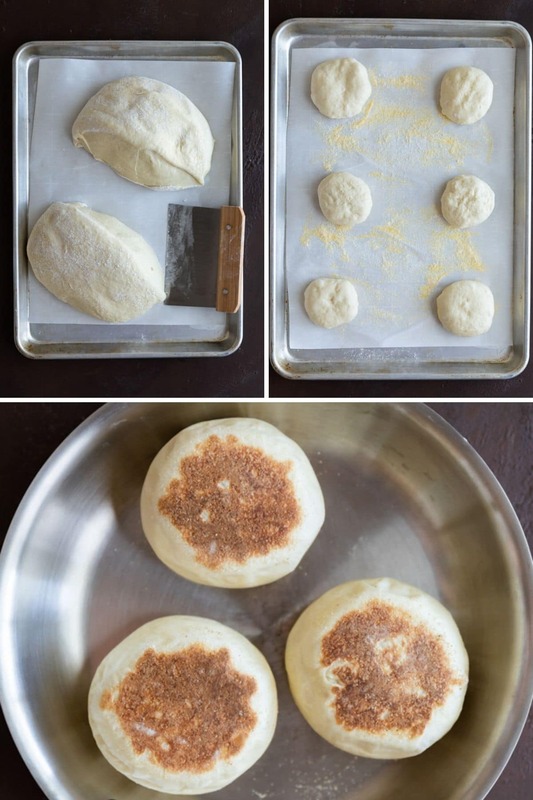 With this tutorial, you can make English muffins at home any time you want. Bread flour is used to give the muffins a chewy texture. The dough is sticky! A sticky dough means there’s optimal hydration to yield nooks and crannies that English muffins are known for. The muffins are toasted on the stovetop then baked in the oven. Baking them ensure the middle is completely done. The dough needs two rises. Once right after it’s prepared and once after it’s divided and shaped into English muffins. Let’s go over how to make it. Or you can scroll all the way down to get the full printable recipe with ingredients. The Dough – This dough recipe is soft and chewy. It’s a basic dough recipe using flour, yeast, milk, sugar, and salt. The dough will be sticky but avoid excess flour. This sticky dough will yield muffins filled with nooks and crannies. Proof the yeast. Warm milk and honey to 105-115°F. Stir in the yeast and set aside for 5 minutes. Then whisk in egg and butter. Make the dough. Use a stand mixer to make it easier since this dough will be sticky. With the dough hook attached, mix flour and salt together then gradually pour in the yeast mixture. Let the dough mix for about 4 minutes until it turns smooth but is still sticky. Proof the dough. Scrape the dough into a lightly greased bowl, cover it with plastic wrap and let it rise in a warm place until it’s doubled in size. This can take about 45 minutes to 1 hour. Divide the dough. Turn the dough out onto a lightly floured surface and divide it into 16 equal sized pieces. Or you can pinch off pieces of dough and weigh them for more uniform muffins. Each piece of dough should weight 60 grams. Shape the dough. Roll each piece of dough into a ball then flatten the ball into a disk. Rise again. Place the disks of dough on baking sheets with parchment paper that has been sprinkled with cornmeal. Sprinkle more cornmeal over the top and cover them with a lint-free towel. Let the dough rise in a draft-free area for 1 hour, until doubled in size. Cook. On a griddle over medium-low heat, brown both sides of each disk of dough. Return the muffins to the baking sheet and bake for 10 minutes. Cool. Let the Muffins cool completely before slicing or the centers will appear doughy. Once cooled, use a fork to split them open. You can toast them in a toaster or toaster oven and serve them with your choice of toppings. How to store English Muffins? Keep muffins in an airtight container at room temperature for up to 2 days or in the refrigerator for up to 5 days. Can you freeze English Muffins? English muffins freeze well for up to 3 months. Thaw overnight in the refrigerator then warm before serving. How to toast English Muffins? Split the muffins open with a fork. This guarantees nooks and crannies! Place each half of the muffin in a taster and toast until the edges are lightly browned. The end result will be a crunchy and chewy texture. YUM! 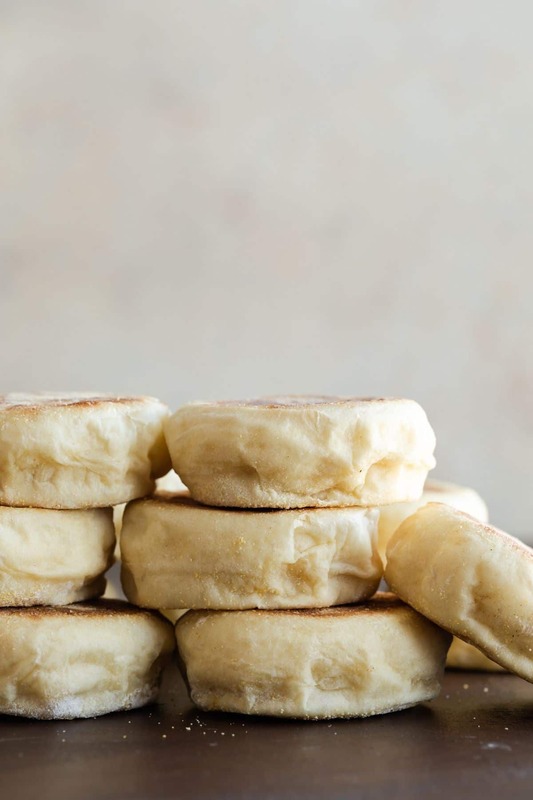 Homemade English muffins are so much easier than you think! This recipe is simple and will give you soft, chewy muffins in no time. Enjoy them with butter or your favorite jam! In a small saucepan, heat the milk and honey over low heat until it reaches 105-115ºF. Remove from heat, stir in the yeast, and set aside for 5 mins. Whisk in the egg and melted butter. Add the flour and salt to the bowl of a stand mixer. Fit the mixer with the dough hook attachment. with the mixer on low speed, gradually pour the milk mixture into the flour. Continue to beat on low until the flour is incorporated, stop and scrape down the sides and bottom as needed. Turn the speed up to medium and mix for about 4 minutes, until the dough is smooth and sticky. Scrape the dough out into a lightly oiled bowl. Brush a little oil over the top of the dough. Cover and set in a warm place to rise for 1 hour or until doubled in size. Divide the dough in half. Divide each half into 8 equal sized pieces. You should have 16 dough balls. (If you want smaller muffins, divide each half into 11 pieces to equal 22 dough balls.) Roll each piece into a ball and flatten the ball into a disk. Place the disks on a baking sheet lined with parchment paper that has been dusted with cornmeal. Sprinkle more cornmeal over the tops. Cover with a lint-free towel and set in a draft-free place for 1 hour, or until doubled in size. Heat a griddle over medium-low heat. Gently lift each disk with a plastic spatula and place it on the griddle. (Handle the dough with care so you don’t deflate it) Cook them for about 2 minutes on each side, until lightly browned on both sides. Work in batches. Place the muffins back on the cookie sheet and bake them for 10-15 minutes. Transfer the muffins to a cooling rack and let them cool completely. Split the English muffins with a fork and toast them a toaster until the edges are lightly browned. Serve warm with your favorite jam or butter. Muffins are good for up 5 days stored in an airtight container at room temperature or in the refrigerator. Muffins can also be wrapped in plastic wrap, sealed in a zip-top bag, and frozen for up to 3 months. Thaw overnight in the refrigerator and toast before serving. To get muffins that are uniform in size, I suggest weighing the dough. For 16 muffins, each portion of dough should weigh 60 grams. I made the dough using bread machine and the result came out just great. Dough is a bit sticky as you had warned but not difficult to manage. Love it, thanks for the recipes. I’m so happy to hear it worked using the bread machine to mix the dough. That’s a great alternative for those who don’t own a stand mixer! First crack at homemade English Muffins. These were absolutely lovely! Perfect rise, soft and fluffy. I am so delighted…will definitely be making these again…and again! Fantastic! Thanks for sharing your feedback! I wish these turned out! It was a long process for them not to. They didn’t rise either time so my finished product was a flat, doughy, dense disk. My yeast was brand new, bread flour was fresh, stuck the dough in my oven, which was off, with the light on during the two rises. Not sure what step went wrong. I’ll try again when I have the time. I’m sorry to hear the muffins didn’t turn out for you! There are a number of reasons that could cause the dough to not rise properly. Did your yeast foam after letting it sit in the warm milk. Even though it was new yeast, it could have been bad. If it didn’t foam, that’s a sign that you need to start over with fresher yeast. Did you heat the milk past 115°F? If it was too hot, it most likely killed the yeast. How did you measure the flour? Did you scoop it out of the bag with the measuring cup? That’s the most common mistake people make when baking. Flour compacts so it’s important to lightly spoon the flour into the cup then level it off with the back of a knife. Or weigh the flour for more accurate measurements. Using too much flour can affect how the dough rises. Made these amazing english muffins today! I did not have bread flour or cornmeal on hand and decided to give them a go with all purpose flour and they turned out wonderful! I used fine bread crumbs in place of the cornmeal. I am so happy that I tried these and can’t wait to make them again using bread flour! Thanks for sharing, Virginia! The bread flour will give the muffins a slight chewiness. This is a superbly easy recipe to follow and makes a wonderfully light but crispy English muffin. Thanks for the details about prepping them for the first rise and cooking them on a griddle as well as the oven. I checked the internal temperature for 195° to make sure they were done inside after baking them; that occurred about 12 minutes into baking. Thanks; now what about a recipe for cinnamon-raisin muffins? Hooray for English muffin success! It’s one of my favorite recipes! Cinnamon raisin English muffins? That is something I can try in the foreseeable future. 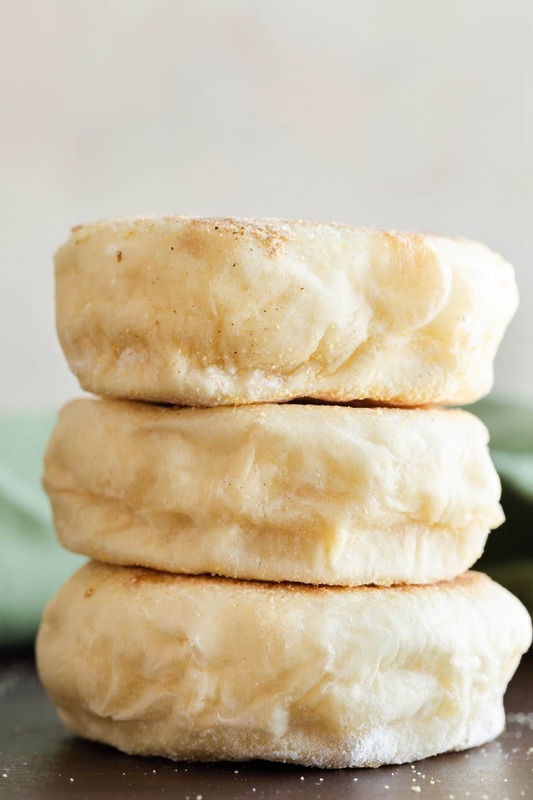 I never thought to make english muffins but your recipe is so beautifully done, I seriously just want to stop everything and make some right now. I am saving it, my daughter will be thrilled if I made this for her. Thanks! Thanks, Silvia! I do hope you enjoy them! I have been making these since last May 2018. 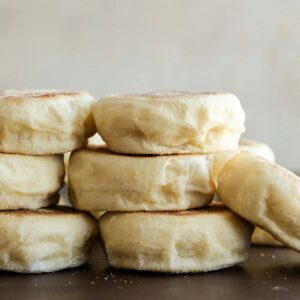 I can’t tell you how many English Muffin gift packages of 8 that I have given away…the comments are always “I will never eat a store-bought muffin again.” This is the type of recipe that goes in Granny’s collection of recipes. Getting ready to make them again…grand kiddo’s are coming for Winter Break…they too love them. Thank you for sharing your recipe. I’m so happy to hear you enjoyed the English Muffins! Loved these! Were a little more on the roll side than English muffin, but will try making them flatter round #2 to see if they get more bubbly in the middle. They tasted delicious nonetheless! Happy to hear you loved the English muffins! Wanting to make these…NOW; but do not have access to “bread flour”. Is there anything I can do to regular flour ( add additional ingredients) to make it close too or the same as bread flour? We are experiencing very bad weather and no store within miles that would carry bread flour. What is the primary difference? Bread flour has a higher gluten content which gives the chewy texture that is well known in bread products. You could use all-purpose flour but you may need to reduce the amount of liquid. I’ve never made the muffins this way so I can’t say for sure how much less liquid to use. You could also try adding wheat gluten to the all-purpose flour but again, I’ve never done this so I have no idea how it will turn out. No access to bread flour here either. I used regular all-purpose and they came out great. Happy to hear the texture came out great with all-purpose flour. I love this recipe! I have made them many times with success each time. I do make mine smaller and end up with anywhere between 18-22. I am not very good about making them the same size. Thanks for the recipe! I gave this recipe 2 stars because it turned out to be a pretty good biscuit. In no way would I call it an english muffin, though. Too heavy and no iconic nooks and crannies. I followed the recipe to the letter. Hi Linda! If your muffins came out biscuit-like, I’m betting that you used too much flour which will cause the dough to be dense. Please make sure you are using weight measurements or spooning the flour into the measuring cup and leveling it off with the back of a knife. Avoid packing the flour down in the cup. Came out perfectly! My husband loves them. Such an easy recipe. Thank you. That’s wonderful! Thank you for trying my recipes and leaving your feedback! Hello, l want to try this your English muffins and this is my first time to make it. I have question to ask you pls, can l use evaporated milk or powder milk ? And how many spoons can be used. Hi Maryam! I’ve never used evaporated milk or milk powder in this recipe so I’m not sure how it would turn out. Excellent recipe, easy to follow!!! I’m sorry the muffins didn’t work out for you. But, the dough should be sticky, that’s the way English muffin dough is. It’s a high hydration dough. You also need to use the full 5 and 1/2 cups of flour. You’re just not adding extra flour after the dough has risen, per the instructions… I’ve never used a hand mixer with dough hooks but I imagine it’s very difficult to do. You’d be better off kneading the dough by hand without a mixer. Can you use 2% milk? I’m guessing probably not, but I just got back from the store and really didn’t want to have to go back. I will if it’s an issue! Hi Liz! I’m thinking it would be okay to use 2% milk but just keep in mind that may affect the taste of the muffins. Just made my first batch using your recipe. I got 16 nice sized muffins, wouldn’t want them any larger. Appreciate the suggestion of using bread flour, think it made all the difference. Recipe directions were very easy to follow, the muffins look beautiful and taste amazing. Instant hit with the family, will never buy store bought again. Thank you! I just made these. I think I need to flatten them more next time. They are really puffy. I can’t wait to try one when they are no longer hot. Also, they were difficult to roll into a ball or should I just fold into a ball like a loaf of bread?? I’ve never had difficulty rolling the dough into balls but if it’s troublesome for you, you can fold them over and pinch the seam. That should work just a well. If I wanted to use this recipe and turn them into cinnamon raisin, what would you recommend as far as how much cinnamon? I haven’t made this recipe with cinnamon so I don’t know exactly how much cinnamon is needed. But I think you could start with a tablespoon and how you like it. Hi- I’ve been making these muffins for about 6 months now- they are FABULOUS! I make the entire batch of dough and then let it go through first rise. Afterwards, I roughly devide the dough in half. I press one half into a rough rectangle (about an inch thick). I sprinkle cinnamon (a tbsp or so) and about a tsp of sugar. I sprinkle 1/3 cup of raisins across the dough and then roll it up and knead it for a few turns. Then, I repeat the process one more time. This marbles the cinnamon and raisins and gives them plenty of flavor. I’ve used less cinnamon and raisins before and they just didn’t seem to taste flavorful enough. This is a good jumping point that you can adjust as your tastes dictate. After this, I divide the cinnamon/raisin dough into 8 pierces and shape like normal. The other half of the dough I divide into 8ths and shape like normal. You could mix in blueberries (very messy, but extremely tasty!) or something else… I’m a fan of the plain ones toasted with a cup of stew or vegitable beef soup. Best part of dividing the dough up is I get 2 different types of muffins with one recipe! I love the idea of adding cinnamon and raisins! Thanks for sharing your experience. They bake up to be roughly 1.5x the size of the packaged English muffins you get from the store. Baked and loved by another introvert. 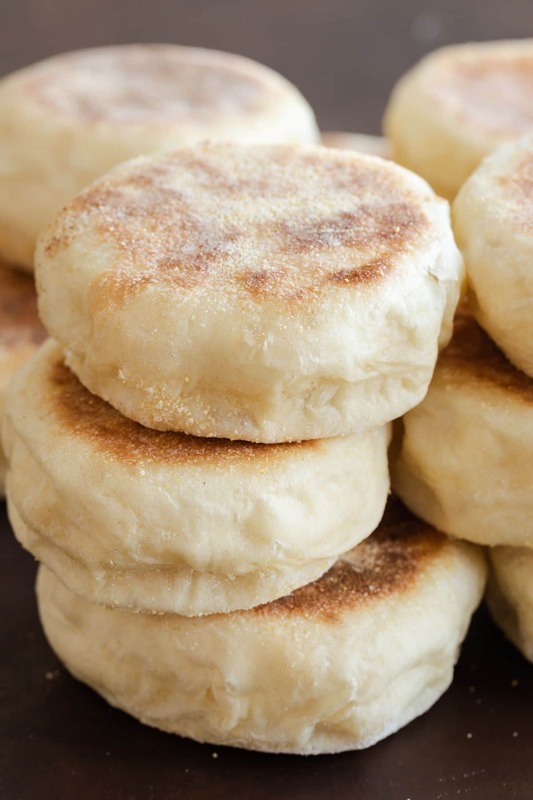 These English muffins are truly amazing and so easy to make. Thanks so much for this recipe. I’m so happy you loved the recipe as much as we do! Turned out perfect and delicious. Thank you for this recipe. If I need to avoid honey how much sugar would I substitute? I haven’t made them without honey but I’m thinking 1-2 Tablespoons of sugar will work. The honey isn’t so much used for sweetness but for flavor. My only comment is that I would definitely reduce these to 12 or 16 because the ones I just made are humungous…. very happy about that, as my kids are away, but for kids, much smaller. I would have never thought to use maple in these. I might give that a try with the addition of cinnamon! And I’ve had complaints about the size before. I just made these for the first time and they seems dense and didn’t rise properly. I’m not sure what happened 😕. Any advice? There are a number of variables that can cause yeast bread to not rise properly. First, check your yeast to make sure it’s still alive. You can do this by activating it in 1/4 cup of water with a tablespoon of sugar before adding it to the recipe. The temperature at which you let the dough rise can also affect the outcome. The environment needs to be warm and draft free. How long you let the dough rise also comes into account. The dough should be double in size at the end of each rise time. How you handle the dough can also affect it. Take your time and be gentle with it. Made these a few times now and my family goes crazy for them. 100x better than store bought and so easy to make. Hi! These look wonderful! Could you use all purpose flour and/or whole wheat flour? Bread flour is going to give you the best results. All-purpose flour and whole wheat flour will yield different textures. These turned out perfect! So delicious, too! I will definitely be making these again!